Melamine dishware is rising in popularity, but how does it stack up against stainless steel? When it comes to comparing dinnerware and dishes, there may be some materials that you have used, but have never heard of by name. Stainless steel is a durable and incombustible material that most everyone is familiar with—but have you ever heard of melamine? What are the differences between the two, and how can you determine which ones are best for your kitchen? Although the name may sound foreign, most everyone is familiar with this type of material. Present in almost every kitchen in the 1950’s at the height of its popularity, melamine tableware is now used in a more casual manner for outside parties and picnics. It’s also been used almost exclusively in children’s dinnerware for the past 40 years. The melamine material itself is virtually indestructible. It’s created by combining melamine with an organic compound and formaldehyde; which are then exposed to intense heat and pressure. The FDA has determined this type of dinnerware is perfectly safe to use. However, it has been proven that over time the chemicals can leach out into food and drink—especially when exposed to high temperatures. As the name purports, stainless steel cannot be marred with tarnish, but it can certainly be scratched! Melamine, on the other hand, does indeed stain over time and the dinnerware loses its color. Since melamine is made out of a hard resin, this type of dinnerware can also be scratched. Although stainless steel is known for its durability, melamine dinnerware poses quite the challenge. Breaking melamine tableware is nearly impossible. One difference between the two types, however, is that with enough force, melamine can actually chip around the edges. Melamine and stainless steel are both recyclable. Although one might think a plastic that tough could not be reproduced from the same material, there are hundreds of recycled melamine products on the market. Melamine can not be microwaved, but that’s because of its chemical compound. Heat in this type of dinnerware increases the risk that the chemicals will seep into our foods during the microwaving process. Stainless steel pots and pans should never be microwaved due to a fire hazard. There are some plates and dinnerware on the market, however, that are made from stainless steel and can indeed be microwaved. This is predominantly evident in children’s plates (as parents try to phase out the melamine). Although the FDA approves of melamine dinnerware, it has severe limitations. Heat can pull the chemicals straight into your food. Stainless steel, however, can be heated to extremely high temperatures, and never emit any chemical materials. It is one of the safest types of dishes on the market. Melamine dinnerware can never be used in any cooking process. Exposure to heat will eventually make the dishes caustic. Stainless steel is used for a wide range of pots, pans, and other kitchen tools. It can withstand exceptional temperatures of heat, and never leak anything into food or beverages. In addition to temperature, another factor that exposes people to the leeching of chemicals in melamine, are acidic foods, like citrus or alcohol. 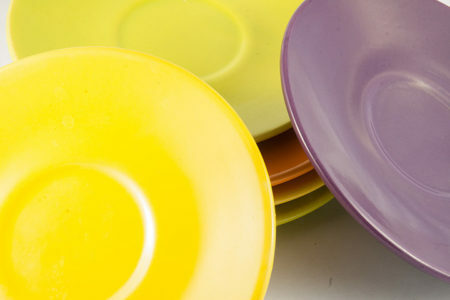 When melamine dinnerware is exposed to acid, it acts just the same as if it was being heated. Stainless steel products, on the other hand, do not respond to the acid or PH in any food or beverage item. Overall, melamine has been proven safe by the FDA and is still used in a variety of outdoor activities. This is in part due to the inexpensive nature of melamine dishes, and the idea that people want to be rid of paper plates. Stainless steel is a material that was once only used for pots and pans, but is now being considered for a variety of dinnerware. Even more astounding, is that the microwave is now accepting of a steel product. When deciding on which style is best for you, consider that they serve two very different purposes, and perhaps you just need them both! Contact Kangovou for more information.